Have a question on Cultus? Cultus is available in 4 different colors - Graphite Grey, Silky Silver, Pearl Red and Aluminium Solid White. 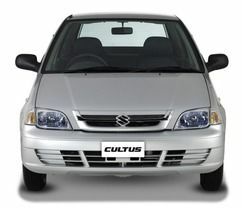 What is the price of Suzuki Cultus? On road prices of Suzuki Cultus EURO II in Islamabad is costs at ₨1.03 Million. What are the colors options available in Suzuki Cultus?